The 2017–2022 Campus Sustainability Plan calls on UC Santa Cruz to develop a plan to add four megawatts of solar photovoltaic to the campus. 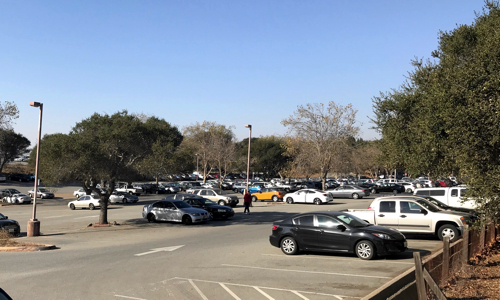 In an effort to reduce the campus’s carbon footprint, a two-megawatt solar parking canopy and energy storage system will be built at the East Remote Parking Lot at UC Santa Cruz. The project will generate more than three million kilowatt-hours (kWh) of electricity, enough to power more than 330 houses for a year, according to EPA calculations. Construction is scheduled to start in 2019. In addition to providing on-site solar energy, the project will allow the campus to store 1.2 megawatts of energy to reduce peak demand and shift load to times of day when electricity is less costly. The intelligent use of energy from the storage units combined with on-site solar energy generation helps maximize clean energy generation and enhance on-site sustainability. The campus has partnered with ForeFront Power for the project through a streamlined procurement process offered by the School Project for Utility Rate Reduction, part of the Utilities Joint Powers Authority of California Public Schools. The 2017–2022 Campus Sustainability Plan calls on UC Santa Cruz to develop a plan to add four megawatts of solar photovoltaic to the campus. Additionally, the campus—as part of a systemwide initiative—will be carbon neutral by 2025. UC Santa Cruz currently has a 250 kilowatt photovoltaic array on the McHenry Library, which provides 25 percent of the annual electrical energy needed for the building. It also provides 75 to 100 percent of the power needed for the building during peak times of year.